2004 was a pivotal year in Western feature-length animation. It’s basically the point where numerous little ideas and theories that people had with regards to successful films of the medium were validated near-totally, and where the stage was set for pretty much the rest of the decade. Maybe even the century if you believe the medium still hasn’t moved past them yet (although it has, mostly). Yet I gave pretty much no column space to this crucial year in the past two weeks. The reasons are two-fold: the first is that Shrek 2 and Shark Tale had way too much to break down with regards to their constructions and failings to find spare time to focus on the medium’s history, the second is that 2005, the first year after the new order takes effect, is a great place to start looking at 2004. In other words; strap in, folks, it’s time for a brief history lesson! So, 2004 was the year in which traditional feature animation breathed its last gasp before finally expiring. It was the year in which Disney released what was planned to be their final traditionally-animated film, the abysmal Home On The Range, and it bombed spectacularly (a worldwide total of $103 million against a budget of $110 million). The failure of their other animated features during the decade (with the exception of Lilo & Stitch) had convinced them that that aspect of the medium was done; and when Disney says that something is beyond hope, you’d better believe that everyone else is going to sit up, listen, and follow their lead. The year’s only other traditionally-animated feature made in the West was the rather successful The Spongebob Squarepants Movie, and you can pretty much guarantee that everyone chalked that up to the built-in fan base of the TV show more than anything else. In 2005, there was one traditionally-animated feature film released in cinemas, Pooh’s Heffalump Movie. That part of the medium was officially abandoned. Instead, as you may have gathered, 2004 was the year of DreamWorks Animation. Pixar may have released The Incredibles to glowing financial and critical success, but DreamWorks released Shrek 2, which was also critically acclaimed and became the highest grossing film of the year. And though Shark Tale would slot very comfortably behind The Incredibles, and have faded from most people’s memories since its release, it still made a lot of money. It made a heck of a lot of money, and it did it by following the Shrek formula (or, more accurately, the Shrek formula but stripped of the heart and sincerity that made Shrek resonate with viewers). This was DreamWorks’ third big hit during the decade, two in the same year too, and it proved that you could apply the (mistaken) Shrek formula to non-Shrek films and make some serious money out of it. Hence why 2007 would bring us Surf’s Up and 2006 inflicted Barnyard upon the world. Meanwhile, 2005 was the year in which those who had seen the success of the first Shrek and hadn’t sat on their hands waiting to see if the formula for success was going to be universal or just a one-off, began to flood the market with their attempts at cashing in on that prospective money pile. Although it wouldn’t hit the US until a year later, and with a localised redub that I hear made things even worse, the UK got themselves a gritty reboot of lovable cult French animated series The Magic Roundabout, with villains and Matrix parodies and terrible covers of Kinks songs and goddamn Robbie Williams (yes, the singer) as Dougal, that they didn’t ask for. Hoodwinked! tried to combine Shrek style humour with a mystery genre and a Pulp Fiction approach to timeline hopping, and brought in modest returns. And then, although this was just as much Disney trying to prove that they didn’t need Pixar should their contract renegotiations go south as it was them desperately trying to stay relevant, there was Chicken Little. I will not waste any more words referring to Chicken Little. 2006 would be the year in which these effects would become pretty much permanent, and naturally we’ll come to that in two weeks, so that makes 2005 the year of transition, as everyone adapted to the new landscape that DreamWorks Animation had genuinely wrought. Well, what of DreamWorks? How did they take 2005, their first full year as a separate and publically traded entity? Rather a lot like 2004, to be frank. 2004 began the release schedule plan of two films from the company a year, released at opposite ends of the year, most likely for maximum canvassing of prospective dollars and to avoid over-exposure of the brand, and 2005 continued that in earnest with Madagascar and Aardman’s first film since Chicken Run, Wallace & Gromit: The Curse Of The Were-Rabbit (we’ll get to that next week). Whilst neither ended up having Shrek 2’s level of success, both were number 1 films, both broke the top 50 films of the year worldwide (Madagascar at #6, Wallace & Gromit at #21), and both ended up as part of very successful franchises that are still going strong today. They even mirrored 2004 critically, too, with one film falling flat and the other film receiving a tonne of acclaim. Today, we’re focussing on the one that fell flat. Although it scored much higher than Shark Tale, Madagascar didn’t really connect with critics; the damning phrase “fun for kids… not much appeal for parents” being applied frequently. Many found issue with the gags, which were either too low-brow or too pop culture-oriented. Several found the premise ludicrous, one outlet saying that it is “pathetically ignorant” and spent an entire paragraph tearing it to shreds for not sticking to some semblance of reality. A repeated thought expressed involved the belief that the quality of the animation didn’t make up for the lack of story or emotional centre. Mostly, though, critics just found it too average to recommend or dismiss. The general consensus primarily being that everyone involved could do better, the looming spectre of the superior Shrek hanging over proceedings. The general public, predictably, didn’t give a toss. It may not have debuted at number 1, opening the week after Star Wars Episode III would do that to you, but Madagascar rode its Memorial Day Weekend release date to a very respectable third place, just below The Longest Yard (the public still loved Adam Sandler and Chris Rock in 2005, let’s not forget), before leap-frogging the pair of them to the number 1 spot next week. That would be the only time that it would occupy the top spot (in comparison to Shark Tale’s three-week run at the top), due to Summer 2005 being pretty damn crowded, but it still hung around the Top 10 for 8 weeks and closed as the 9th Highest Grossing Film Domestic of 2005. Overseas, it was somehow even more successful, accounting for over 60% of the total worldwide gross. Audiences, then, couldn’t get enough of Madagascar. So much so that a major franchise ended up spinning off of it, one that currently encompasses two sequels with a third on the way, two holiday-themed TV specials, a spin-off television series for the penguins and a film version of that spin-off hitting theatres before this year is out. The franchise has currently grossed $1.8 billion, is only behind Shrek, Ice Age and Toy Story in terms of highest grossing animated franchises of all-time, and is DreamWorks Animation’s other big consistent cash-cow with no signs of slowing down or letting up now (the Penguins movie may even reverse the poor year the company’s been having financially). Unlike with Shark Tale, I can see why Madagascar caught on to the extent that it did, and not just because Pixar didn’t release a film that year. It’s a damn good film, there’s a lot to like. It’s not a great film, mind, and I’ll get to why it’s not in a short while, but it’s the kind of good film where one may not notice that it’s not great if they’re not 100% engaged with the film or, you know, they just don’t care. That’s why Madagascar connected so well with kids (the unabashed target market of this one) and their half-paying attention parents, because there really isn’t much wrong with it for those who just want a good time. I do firmly believe that kids are way smarter than most movie critics give them credit for, but I will concede that, having been one myself once, sometimes they’ll just want something fun that they don’t have to think about. 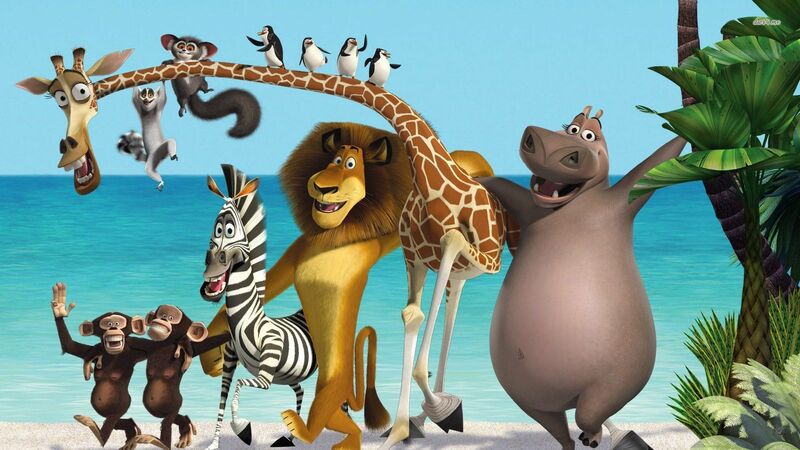 That’s what Madagascar is in its best moments, a very fun joke machine. At the time of its release, a lot of us more animation focussed film critics were tripping over Genndy Tartakovsky’s Hotel Transylvania for bringing classic Tex Avery-style fast-paced squash-and-stretch animation into the 3D realm, but Madagascar was at least trying to ape that style a good 7 years earlier. Unlike Shark Tale’s occasional attempts at using fast-paced animation for sudden silly visual gags (the “lunch is coming up, so I’m only going to do the bare minimum amount of frames before knocking off” version), Madagascar sticks to the manic, fast-paced animation style throughout. Characters movie primarily in a stiff pose-to-pose manner, only becoming more fluid when the pace of the movie slows down somewhat, allowing for sudden bouts of physical violence and what have you to carry an impact without feeling jarring and out-of-place. The film’s colour scheme is bright and breezy, often rather primary, to reflect that attempt at old-school animation. Facial animations are wildly exaggerated and very expressive, again reflecting the “whacked out” (the animators’ words, not mine) mood of the dialogue and the film. Character designs, meanwhile, were inspired by a cross between the real animals and caricatures of said animals, with the results turning out way better than that sounds like it would on paper. They’re all distinct from one another and recognisable as each species, but they never fall into any uncanny valleys or look anything less than huggable (possibly because nobody tried to make them look like the people voicing them, Shark Tale). And then there’s the little touch of having them mostly move like humans (although this mainly applies to Alex and Gloria due to the nature of their anatomies). Instead of feeling lazy, like the animators were too bored to learn how to animate quadrupeds, it adds to their characters, being city folk lost on a wild desert island they clearly won’t survive on. In case you hadn’t gathered, the animation works. It’s not stand-out, attention-commanding, tear-inducing-at-the-beauty amazing, but it works for the film, it works for the style that the film goes for which, arguably, is what a film’s animation should primarily attempt to do. In this case, it works for the rapid-fire joke machine style of Madagascar. This is a film that comes hard and fast with gags that, for the most part, land to varying degrees of success. The best ones are the physical gags, which play off the animation very well. For example, look at the frequently-referenced-nowadays gag where an old lady beats up Alex. Now, yes, the joke is that an old (possibly Russian) lady is beating up and threatening a lion, which is easy humour, but it’s the animation that sells it (especially since Ben Stiller’s voice work here is… er… we’ll get to that). It’s not just that she is beating up Alex, it’s that she is manhandling him to an absurd degree. The squash-and-stretch nature of the animation enhances the joke because it conveys the degree to which she is dominating the fight, the pose-to-pose nature demonstrating the ridiculousness of the situation with easy to convey stances, and the speed of the animation – all frames that would have made it overly smooth clearly got deleted – allows the joke to last precisely as long as it needs to. Yes, I know that explaining the joke is really boring, but picking apart this particular moment allows me to easily explain why the physical humour works so well, because the animation and pacing are calculated to perfection. Which brings me to the penguins. I remember these four being my favourite part of the film when I was a kid, and they’re my favourite part of the film now a near-decade later. Why? A few simple reasons. 1) Their characters are strong. All four of them have individual designs without them ever feeling disjointed (read: you can tell them apart and they all remain looking like penguins), whilst their personalities are similarly distinct if a bit one-dimensional – although that’s not an issue in this case. 2) The animation. The pose-to-pose squash-and-stretch animation really does wonders for this lot; apply what I said with regards to the old lady in the last paragraph here and multiply that phrase tenfold. 3) The voice work. Oh, man! Tom McGrath, Chris Miller (not that one), Christopher Knights and an uncredited Jeffrey Katzenberg are near-perfect in their roles, their various line deliveries make pretty much anything gold. Co-director Tom McGrath, especially, runs circles around the rest of the voice cast as Skipper, to such an extent that his temp tracks became the official voice for the character (we will likely address this a bit more later in the series). If I could find a compilation of their scenes in this film, I’d embed it for you, but I can’t so you’ll just have to trust me when I say that their every scene is friggin’ hilarious. Unless you’ve seen the film, in which case you’re probably just nodding your head in agreement right now. I’m starting to sound really positive on Madagascar, so let’s temper this enthusiasm with the reasons why I noted that the film is only good and not great. The first is that the voice acting is… well, it’s poor. Not for the penguins or Mason the chimp (definitely not Mason, his sophisticated British accent is never not a delight), but the main cast are pretty terrible. Ben Stiller is frequently too flat – I remind you of the old lady segment and how his voice makes it seem like Alex is instead being lightly annoyed by a fly – to be convincing, Chris Rock’s voice is too distinct to slip away into Marty the Zebra and, unlike Eddie Murphy in Shrek, he doesn’t invest in the character enough to make up for that fact, David Schwimmer seems more poorly directed than just plain bad (he is trying, if nothing else), whilst Jada Pinkett Smith gets nothing to do as Gloria and uses that as an excuse to not even bother trying. It means that, whilst the film is still very funny, a lot of the verbal jokes don’t hit as hard as they should. Speaking of those jokes, they’re at their best when they focus on physical humour and come from character work, however minor. Sometimes, though, we are dropped into various pop culture references and their every appearance may as well have been accompanied by an orchestra of crickets. They primarily come from music cues, too, that laziest of laugh-inducers unless done really well. Marty’s walk through New York is backed by “Stayin’ Alive” and shot like that one Saturday Night Fever bit, most likely because everyone wasn’t confident in their one gag (Marty doing a double-take at the zebra-style shirt a female pedestrian is wearing) being sufficiently appreciated. Then there’s the ending of the scene where the Statue of Liberty SOS torch (very much in character for the cast, adding to the ridiculousness of the joke) ends up being revealed as a reeeeally strained set-up for a G-rated reference to Planet Of The Apes that everybody had done before. See, in those worst moments, they end up undercutting the perfectly fine joke that they’d been a feature of. In their better moments, they’re unnecessary distractions that lessen but don’t totally kill the impact of the joke itself. For an example of the poorer side, I point you towards King Julian’s nickname for the gang, “The New York Giants”, a pun that is a giant groan-inducer the first time it is mentioned and which only gets more groan-worthy the more times it ends up getting trotted out (although I appreciate the filmmakers trying to make it a character beat). An example of the latter involves the reunion of Marty and Alex on the beach – the clip is embedded below – where a perfectly funny joke that would work with almost literally any other music cue has its true power kneecapped because they just had to cue up the Chariots Of Fire theme. It’s lazy and pointless, almost purposefully kneecapping great jokes thanks to blaringly loud pop culture references the film stops to point out. Oh, and whilst I’m pointing out flaws on the comedy side, I really don’t like King Julian and the rest of the lemurs. Sacha Baron Cohen’s voice is distractingly flat and irritating, their jokes aren’t funny and they serve pretty much no purpose to the plot. Seriously, they barely factor into the thing, pretty much only turning up because it would be weird to have a wild jungle without some kind of wildlife. The Fossa threat could have been featured without needing the lemurs, as the lemurs smack really hard of Token Kid-Focussed Comic Relief; hence the legendary and really-painful to sit through “I Like To Move It” sequence, even if that was actually just an improvisation by Sacha Baron Cohen – you know, in case you were looking for reasons to vehemently dislike him. But the true reason why Madagascar is only “good, not great” is because the film is such a joke machine that its attempts at poignancy and drama and heart don’t resonate. Every single time that the film tries to go for something genuinely heartfelt, it undercuts the scene with a joke or a music cue. The scene where Alex first goes feral and bites Marty should be genuinely emotional, but it’s played for awkward laughs. The requisite sad times montage is backed by Louis Armstrong’s “What A Wonderful World” which is just too on-the-nose to register as effective soundtrack dissonance, and said montage also further undercuts its attempts at sadness with some of the film’s funniest jokes. Of course, more problematic is the fact that the cast are too one-dimensional for the attempts at drama to work. Due to the film being a joke machine, this means that the cast take a lot of snipes and swipes at each other for the sake of laughs and very little time is spent showing them as genuine friends whose bonds are strong and worth investing in. The start of the film attempts to do that, but then Marty gets out into New York and we descend into pure jokes, barring one scene, which is disappointing. The jokes are often funny, don’t get me wrong, but it means that the film ends up as more disposable than it could have been and makes its few legitimate attempts at non-undercut drama ring hollow. All this being said, I see why people really liked Madagascar, how this franchise ended up getting kick-started, and why the penguins are so popular that they’re getting a movie spin-off of their TV spin-off. It’s a good film, the kind of good film where I would more than happily take a chance on a sequel due to the potential clearly on display in the first film; something I imagine a lot of parents used as a rationale behind purchasing tickets when the sequel came about (you know, along with “it will shut the kids up for 90 minutes”). It doesn’t hit the heights of some of DreamWorks’ prior accomplishments, but it’s also a damn sight better than anything they released during the 12 months of 2004. It’s fun, it’s breezy, it’s disposable, it’s good but not great and sometimes that’s all the public needs. Plus, you know, easy-to-latch-onto catchphrases for the kids. That always helps (drive everyone else insane so please stop doing them, filmmakers). Madagascar continued DreamWorks’ box office streak into its second year, and although critical opinion of the company was still at an all-time low, they could at least comfort themselves from the mean words of the critics by bathing in the pool of cash, Scrooge McDuck-style, that the film ended up bringing in. Meanwhile, Aardman Animations were putting the finishing touches to their theatrical follow-up to Chicken Run, the big-screen debut of the beloved duo that made them household names in the UK, and an animated film that many would argue is one of the finest of the decade. Next week, we turn our attentions to Wallace & Gromit: The Curse Of The Were-Rabbit. Callum Petch puts on lipstick, the price is: what?! Follow him on the Twitters (@CallumPetch)!